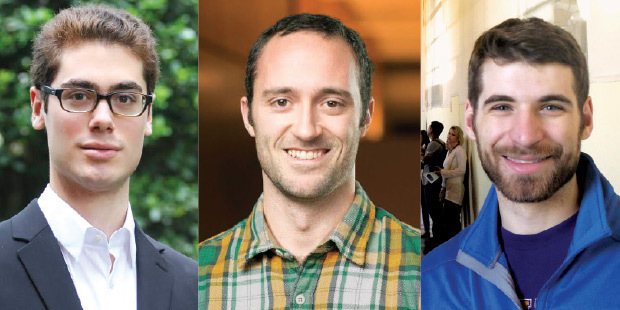 The Center on Law and Security selected Joshua Fattal ’18 (pictured above, far left) and Kevin Kirby ’17 (center) as scholars for ASPIRE (A Scholarship for Service Partnership for Interdisciplinary Research and Education), a program funded by the National Science Foundation and run in conjunction with NYU’s Polytechnic School of Engineering with the goal of training cybersecurity specialists. ASPIRE provides a full-tuition scholarship, a stipend, and a wide range of interdisciplinary academic opportunities with students and faculty from other NYU schools. Fattal, a Phi Beta Kappa graduate of Columbia University, will examine the implications of cybersecurity for balance between privacy and national security. Kirby has an interest in national security law, renewable energy, and computer programming. He previously served five years as an army engineer and graduated from the United States Military Academy at West Point. The two join Brian Eschels ’16 (far right), who was named an inaugural ASPIRE scholar last year.